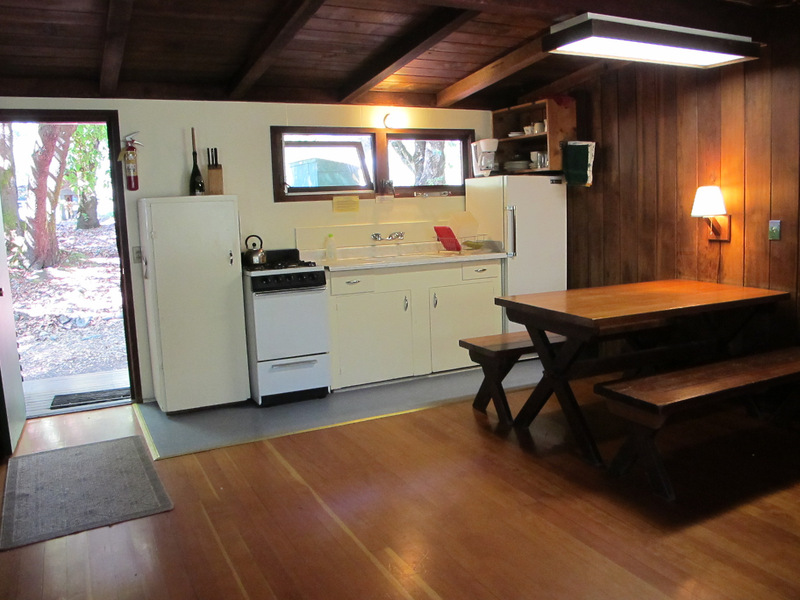 Our Klamath River vacation cabins come with a full kitchen & linens, private bedroom, bathroom and a deck that looks over the Klamath River. 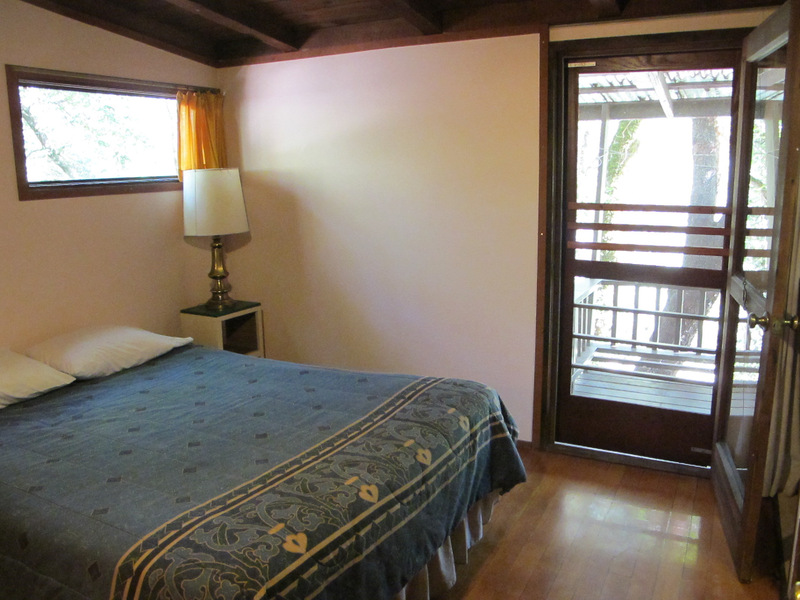 The bedroom has a queen bed, and two more twin beds can be made in the common kitchen/living room area. 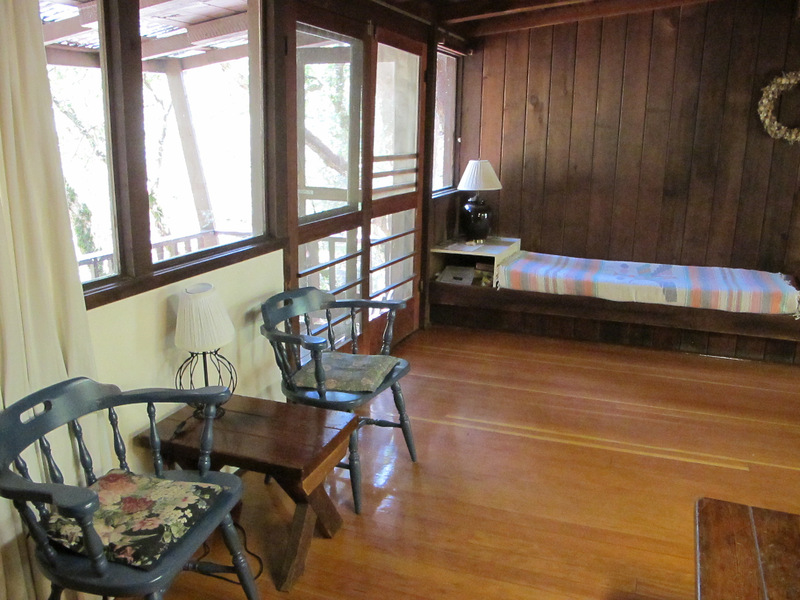 All of our cabins have identical floor plans, with the exception of Cabin 6, which is slightly larger, (it has a second bedroom with queen bed, and more windows facing the river). 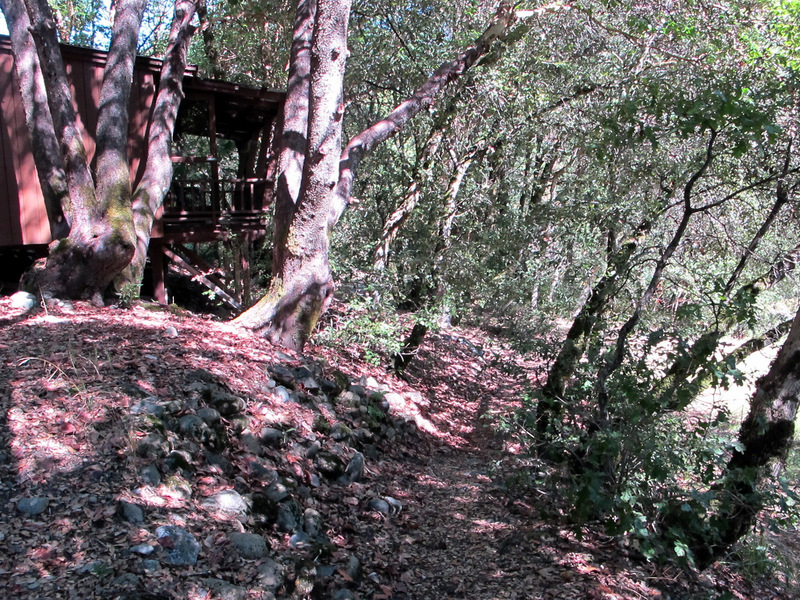 It's a short walk down a path to our private sandy beach and swimming hole located across from Pearch Creek, a pristine mountain stream that can be heard from the cabin decks. 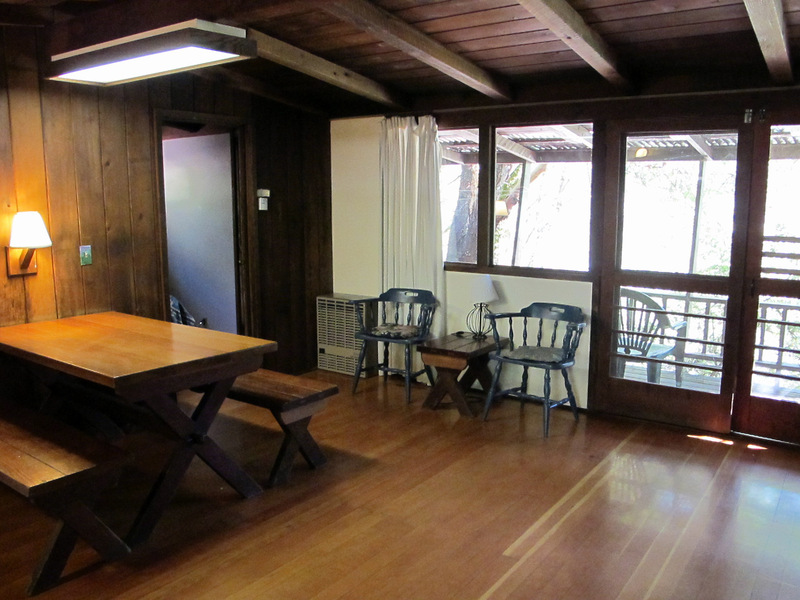 All cabins have a clean, aesthetically pleasing, rustic appeal of solid redwood interior with hardwood floors. Our pet friendly lodging is open to all four-leggeds, as long as they can behave around our goats & chickens! We give preference to full week bookings during our peak season of mid June through mid August. You may place a reservation using our calendar, sending us an email or giving us a call at 530-627-3379. 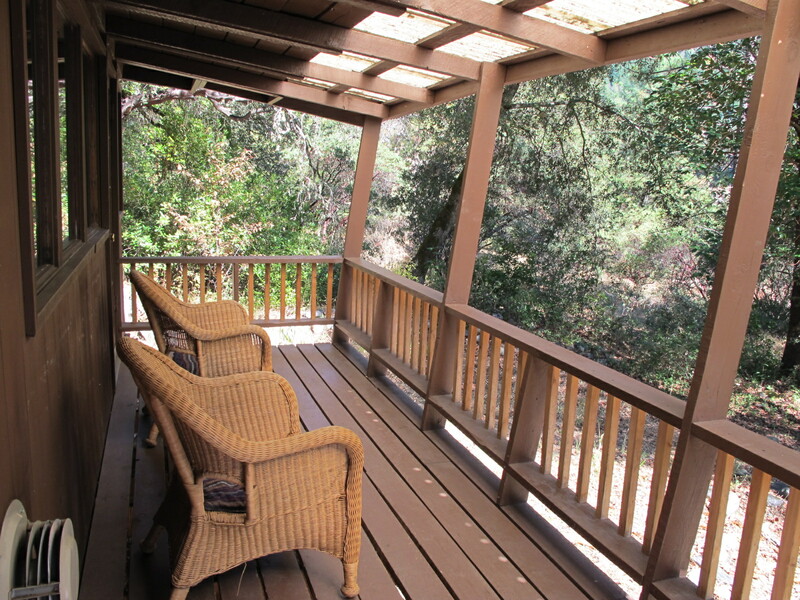 Cabins 1-5 are $110/ night for up to two people, Cabin 6 is $135/ night for up to two people. Kids 5-12 are $7 each, kids under 5 are free if you bring your own bedding. Pets are $10 for 1-3 nights, $20 for 4-7 nights. Book a week and the seventh night is free! Book 1 week and get the 7th night free. Due to our limited season and cabin availability a deposit of 50% is required to confirm a reservation. We accept checks, VISA & Mastercard. Deposits are refundable (less a $25 cancellation fee), or may be applied in full to your next reservation provided cancellation is made no less than 30 days prior to your reservation date. Cancellations made with less than 30 days notice will be refunded or applied to your next reservation (less cancellation fee) only if we are able to book the vacancy. Single night stays will be charged for the total amount upon reservation confirmation. Contact us with questions at any time. Plan your family reunion as far ahead as possible to accommodate people's schedules. Summer months tend to be best for family reunions as kids are out of school and the weather is ideal for outdoor activities. Appointing one or a two family members to photograph your family reunion can help capture some great moments. Allowing a full week for a family reunion creates the flexibility for folks with busy schedules to attend a few days. Don't forget cameras, outdoor games and party food! 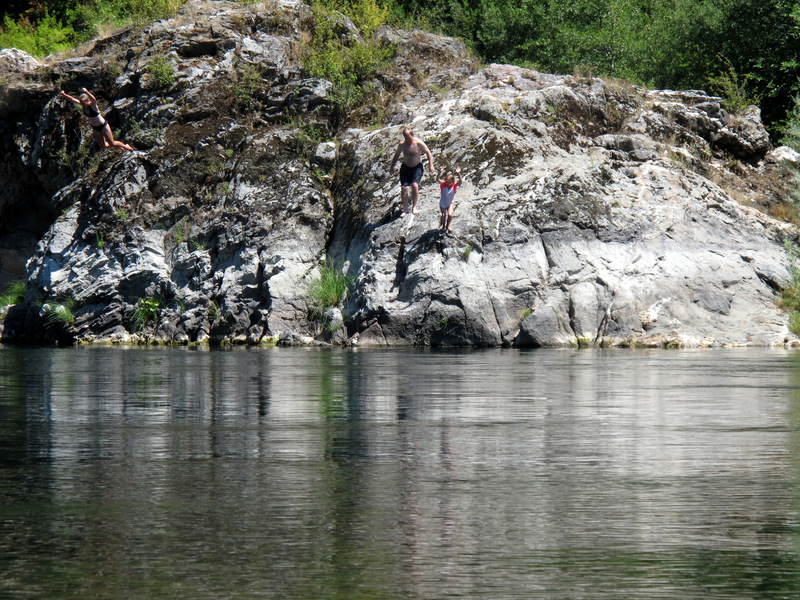 "The Rock" is a large outcrop located on the opposite bank of our swimming hole, where Pearch creek meets the Klamath River. 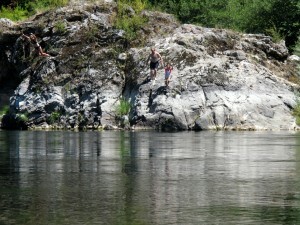 Great for jumping off, or just hanging out, t's a favorite destination on a warm, sunny day. 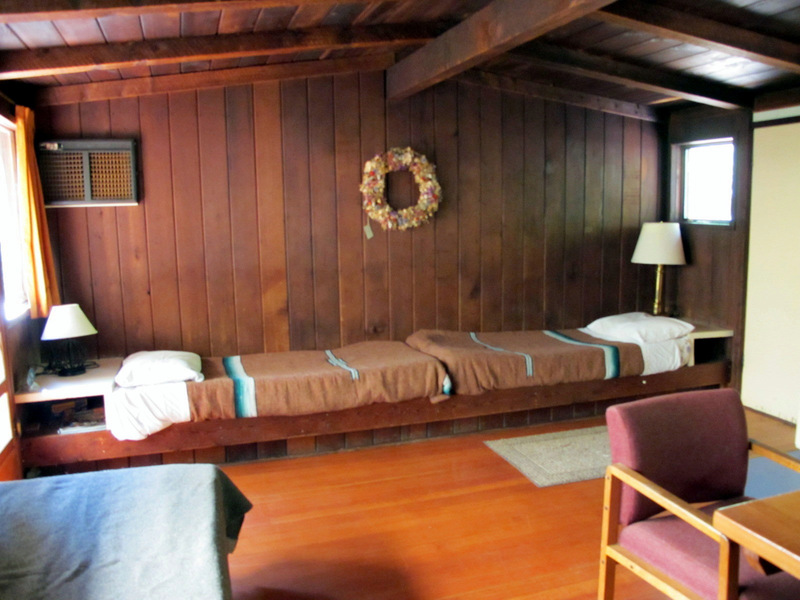 Our riverside vacation cabins were built in 1950 by Carl Maldwin. 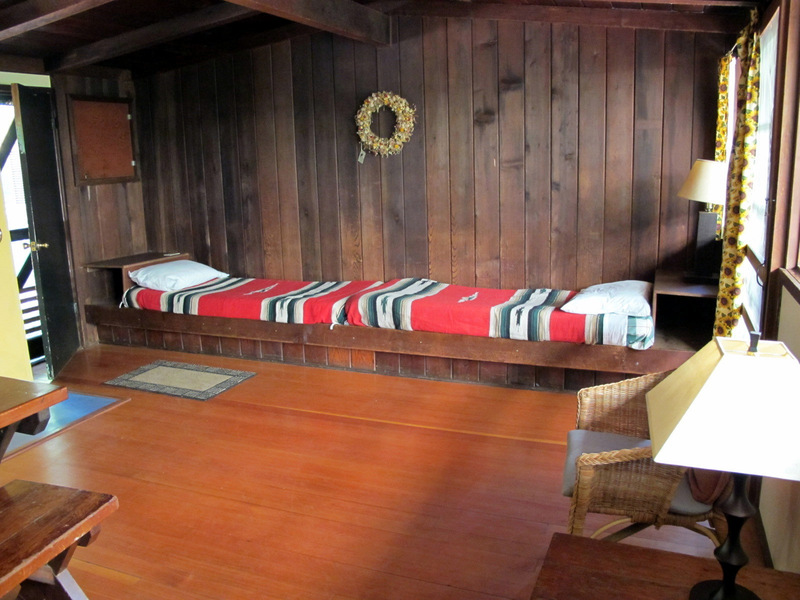 His solid craftsmanship and sharp eye are evident in the construction of the cabins, using clear grain redwood for the structure and old growth Douglas fir for the flooring. 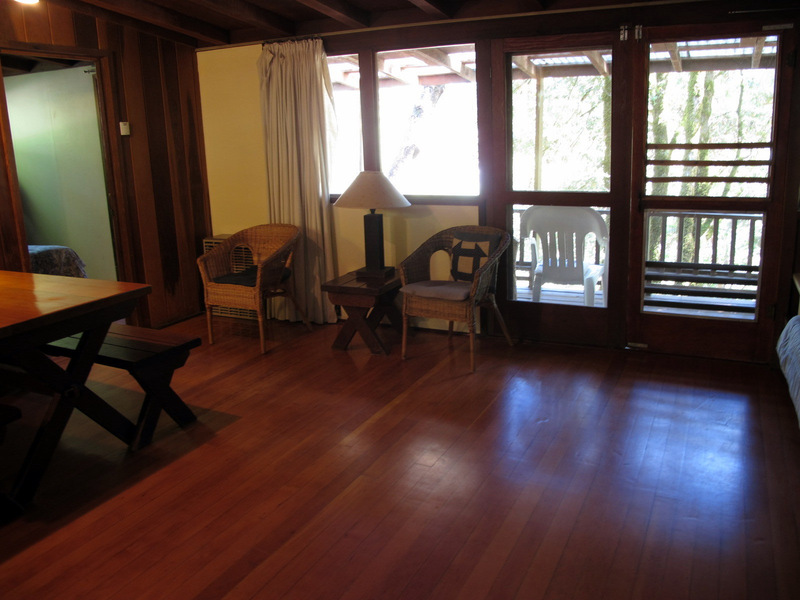 We have kept the same basic cabin footprint; a simple, efficient design with an aesthetically pleasing rustic feel. Back in 1950 Orleans was even more of an outpost than it is today, Highway 96 was not yet paved and there was no electricity. Fisherman typically rented cabins for several weeks at a time. (Carl sold Sandy Bar Ranch to Laverne Glaze, who lives next door to us now, and we purchased SBR from Laverne in 1992). Carl and Jeannie Maldwin were our neighbors for several years after we arrived and each time we saw them Carl would always have a story or two to tell us about the ranch, the cabins, the early days, or characters he'd known on the river.